Spring has arrived in Iowa City and it’s time to check those numbers to see how the real estate market is doing. Spring is the busiest time of the year in a transient town like Iowa City and buyer demand is high. That’s why it’s a bit of a surprise to see home sales down 8% in the first 3 months of the year. 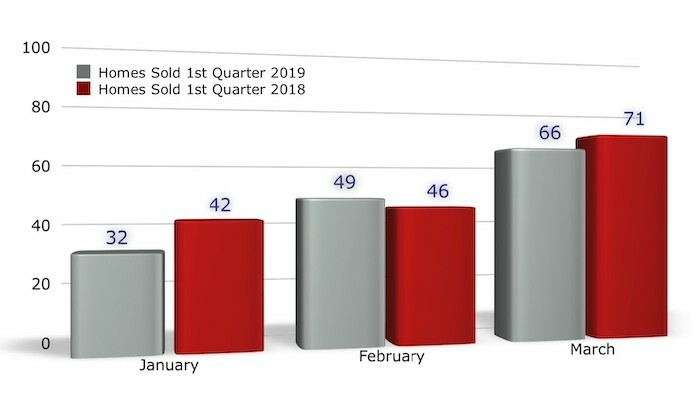 147 homes sold January – March 2019 compared to 159 homes sold in the same time frame in 2018. It’s possible the long winter slowed buyers down this year. It’s also possible there aren’t enough homes on the market for the many buyers out and about. It’s early days for the spring market in Iowa City. The next few months will clarify whether the lower home sales are a blip or a trend. In addition to looking at home sales and home prices in the first quarter, the absorption rate and the contract to listing ratio both help to provide a clearer picture of how the Iowa City real estate market is trending. The absorption rate provides information on the turnover rate of homes in Iowa City. That calculation looks at sold listings and how long they took to sell. The average time on market in Iowa City is 3.5 months or 106 days. Anything under 6 months is trending towards a sellers market. At 3.5 months it’s definitely a sellers market. The contract to listing ratio looks at what is happening in “real time” and how many buyers are writing contracts. This calculation looks at homes contingent or pending that are waiting to close. Currently 43% of the homes listed on the Iowa City MLS are under contract. This is another good sign that there are a lot of buyers out and about writing contracts. Home Sales in Iowa City are down 8% compared to last year. 147 homes sold January – March 2019 compared to 159 homes sold in the same time frame in 2018. The absorption rate is at 3.5 months, that’s 106 days on market and strongly trending towards a sellers market. There are currently 305 homes in Iowa City showing as Active Listings on the MLS and 227 homes are currently showing as Contingent or Sale Pending – That means 43% of the homes listed in Iowa City are under contract. This needs to rise to closer to 50% in the next couple of months to be in line with previous years. Even in a sellers market homes don’t sell themselves, sellers will always benefit from the expertise of a good Realtor. Knowing what to expect of the market for your specific home in your specific neighborhood is key to your success. Whatever your real estate goals are, when you’re ready to work with an agent who has a reputation for doing what it takes to make yours a smooth and stress free buying or selling experience, you can reach Denise directly at 319-400-0268, or of course email works too!